Man, oh man! Tons of flavors happening in this little salad! Radicchio is slightly bitter, which I happen to have a taste for right now. But never fear…roasting it brings on a whole new flavor that’s dense and savory. Endive is also known to be a bit on the bitter side, so if that isn’t quite your thing, swap it out with a bit of arugula or baby spinach…easy, peasy! 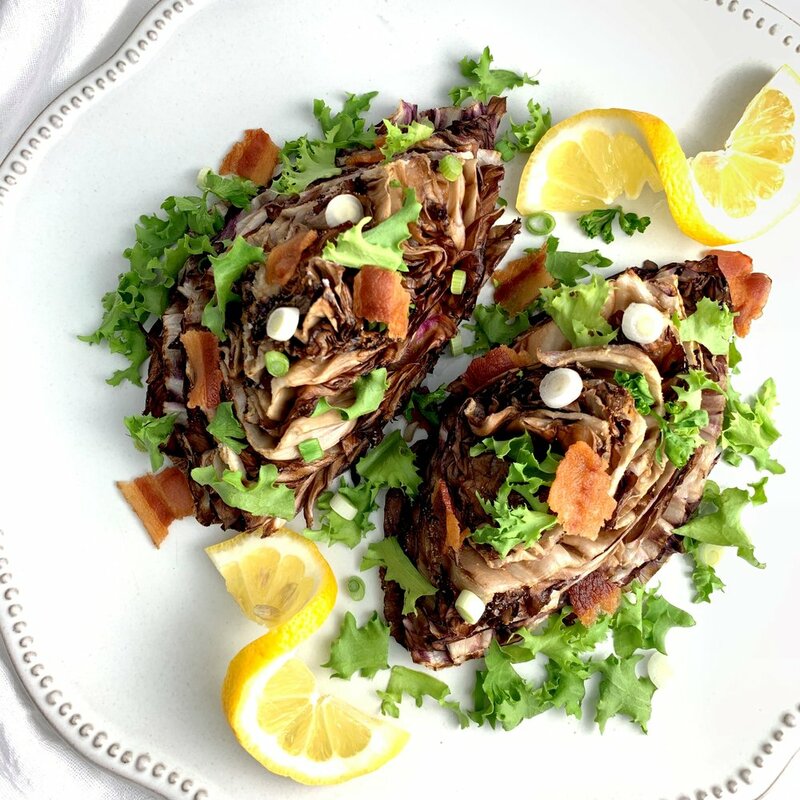 I’ve topped it with a sweet lemon vinaigrette and salty uncured bacon, which balances out the radicchio well AND hits all my favorite flavor profiles! Plus, this is a great side or appetizer salad. Radicchio isn’t huge, so the natural portion size is great. Cook the bacon in a skillet, reserving the rendered fat when done. Crumble the bacon and set aside. Chop the radicchio into quarters. Brush the radicchio wedges with the tendered bacon fat. Sprinkle the wedges with the sea salt and garlic powder. Line a sheet pan with parchment paper. Place the wedges on the sheet pan and put in oven. Roast for 8-10 minutes. Remove wedges from oven and place on a serving dish. Garnish with endive, parsley, bacon and green onion. Drizzle with vinaigrette upon serving.